Meet Mr. January | From the Seasonally Occupied Territories . . .
Last April I got a call from photographer Lisa Bibko-Vanderhoop. I didn’t know Lisa, but I did know that she produces the Vineyard Seadogs calendar. Turns out that was what she wanted to talk about. 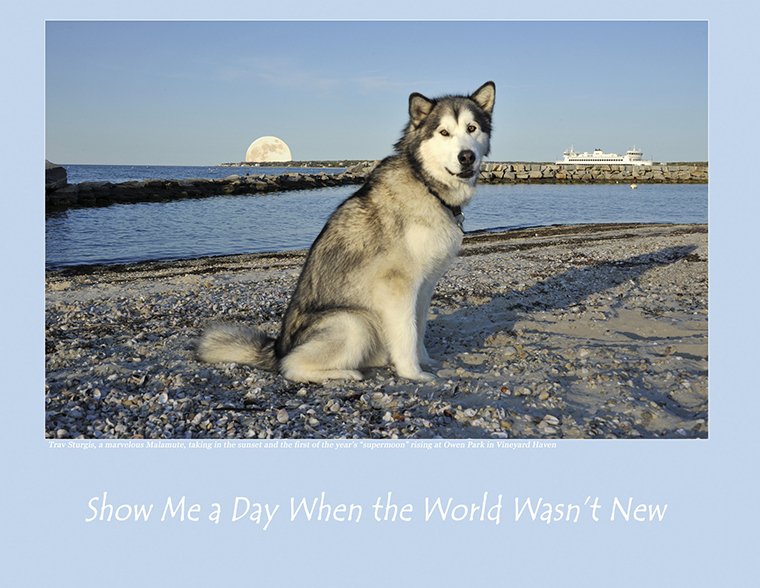 She’d been wanting a northern-breed dog to include in the calendar, and she’d heard from Kerry Scott, proprietor of Good Dog Goods in Oak Bluffs, that I had an Alaskan malamute. Would he be willing to be photographed? The so-called “supermoon” was coming up: the May 4 full moon would be closer to Earth than any other full moon of the year. Wouldn’t Travvy’s wolf-like profile look great against a big, bright full moon? Yes, it would — but the challenges of lighting and weather scuttled that idea. Instead we met at Owen Park, on Vineyard Haven harbor, late in the afternoon. I had my apprehensions: for Trav, the harbor was a brand-new place, full of unfamiliar smells and shells and, even in early May, plenty of human, canine, and avian activity. Would he be too distracted to focus on the task at hand? Not to worry: Trav was a trouper. Not long afterward, Lisa emailed me the photo and said that Travvy was going to be Mr. January in the 2013 Vineyard Seadogs calendar. I was thrilled. Trav and I told all our friends, then settled down to wait impatiently till the calendar was available. It’s finally here! You can preview the images on Lisa’s website. Lisa is an excellent photographer, and Martha’s Vineyard is nothing if not photogenic, but it’s a rare Vineyard scene that can’t be improved by the presence of a dog. Contrary to popular belief, there’s more to Vineyard dogdom than Labrador retrievers. The new year’s Seadogs include a mastiff with (at least) eight mastiff-pit bull mix puppies; four papillons; an Irish wolfhound towering over a Weimaraner puppy; two German shepherds playing in the surf off the Gay Head Cliffs; and a schnauzer. Yes, there is a Lab, and a couple of goldens too. 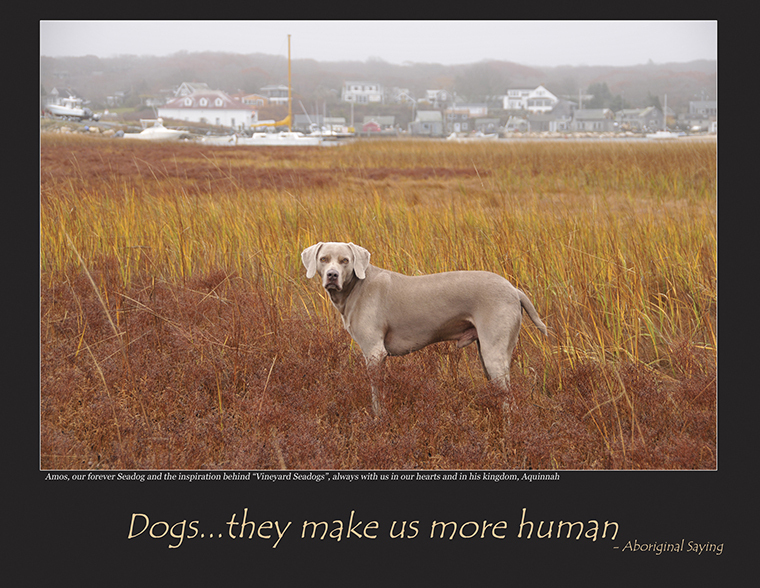 Mr. October is the late Amos, Lisa’s Weimaraner, who inspired the first Vineyard Seadogs calendar seven years ago. The calendar can be ordered on the website for US$16 plus shipping and handling (which is calculated based on your shipping address). Pay by PayPal or any major credit card. If you’re on the island, it’s available at Bunch of Grapes Bookstore, Edgartown Books, Good Dog Goods, Rainy Day, Alley’s, Cronig’s, Craftworks, SBS, Rosecuts, Two Susans, Tisbury Farm Market, and Trader Fred’s. Lisa’s always on the lookout for future Vineyard Seadogs. If you know of one, let her know! She also welcomes orders by e-mail. 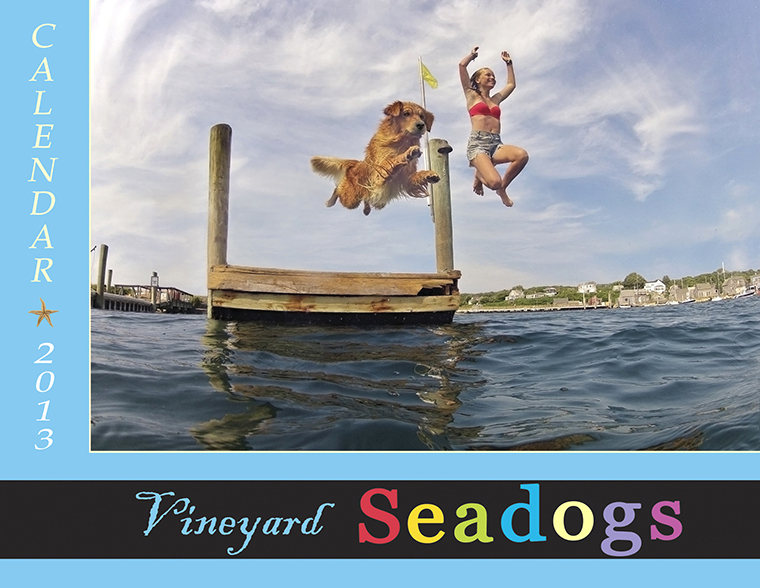 This entry was posted in dogs, Martha's Vineyard, outdoors and tagged dogs, Lisa Vanderhoop, Travvy, Vineyard Seadogs. Bookmark the permalink. The photo of Travvy is SPECTACULAR! What a great shot! Congrats!